Shia’s new film, Disturbia, which is still in theaters, is a certified box office hit and most reviews were good. It was officially announced, on April 14, that Shia will have a large, but yet undefined role in Indiana Jones IV. There has been speculation that Shia will play Indiana Jones’ son. 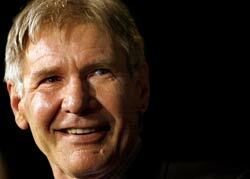 As in the previous three “Indy” films, Harrison Ford will play Indiana Jones. Like Shia LaBeouf, Ford is the child of a father who is not Jewish and a Jewish mother. Unlike Shia, who was raised Jewish, Ford was raised without religion and has never adhered to any religious faith. Interestingly, in the third Indiana Jones movie, Indiana Jones and the Last Crusade, (1989), the role of “Young Indy” was played by River Phoenix, a very talented actor who tragically died of a drug overdose in 1993. Like Shia LaBeouf and Harrison Ford, River Phoenix was the son of an interfaith marriage. Jennifer Westfeldt, 37, co-stars in the ABC series, “Notes from the Underbelly,” which premiered on Thursday, April 12. The show is about how Jennifer’s character’s pregnancy affects her and her marriage. Right now, “Notes” airs on Wednesdays at 8:30 p.m., but check your local listings. Past episodes can be viewed at ABC’s website. Westfeldt, who is Jewish on her mother’s side and identifies as Jewish, is best known as the star and co-writer of Kissing Jessica Stein, a 2001 indie film hit about a straight Jewish woman who is dissatisfied with the guys she is meeting and ends up having an intense but short-lived lesbian affair with a woman from a different faith background. However, Westfeldt is used to putting herself in fictional situations that don’t quite match her biography. Unlike the fictional Jessica Stein, Westfeldt says that she has never had a lesbian affair. To add to the irony, the woman who played Jennifer’s lesbian lover in Kissing, Heather Juergersen, is also straight in real life. Juergensen co-wrote Kissing with Westfeldt. Westfeldt is also the writer and star of the indie film Ira and Abby. It’s a romantic comedy that Westfeldt is now showing at film festivals, but has not been generally released. In this movie, Westfeldt plays a woman who marries a Jewish guy after a whirlwind courtship. A major theme is the cultural and religious differences between the couple’s families. Again–perhaps with some irony–Westfeldt cast herself as Abby, the blonde woman, while an actor of another faith (Chris Messina) who looks somewhat stereotypically Jewish plays Ira, the Jewish guy. Variety gave the film a pretty good review and I am looking forward to seeing it. I suspect that Westfeldt, coming from an interfaith background, got “right” a lot of details about an interfaith relationship. For example, in Kissing Jessica Stein, Westfeldt avoided the temptation to turn Jessica Stein’s Jewish mother (wonderfully underplayed by Tovah Feldshuh) into a stereotypical screaming Jewish mother who freaks when her daughter has a lesbian affair. Rather, the mother was a multi-dimensional person who sensitively tried to understand what her daughter was going through. A few weeks ago, I got the first of what I call “election year chain e-mails.” Somewhere out there in “Jewish community land” somebody created an e-mail heralding the so-called Jewish ties of two major current political figures. (I have already received this e-mail from three separate people). In 2000, I was amused when I got a chain e-mail passed-on among groups of Jews. This 2000 election year e-mail claimed that the mainstream media had it all wrong. Senator Joseph Lieberman was NOT the first Jewish vice-presidential candidate running on a major party ticket. No, said the e-mail writer, the first Jewish vice-presidential candidate was, in fact, Levi Morton, a Republican who served as vice-president under President Benjamin Harrison (1889-1893). What was the evidence for Morton being Jewish? This e-mail didn’t spell it out, but it strongly implied that somebody with the first name “Levi” had to be Jewish! I checked reliable sources and dug-out that Levi Morton was of old WASP stock and his father was a Protestant minister. I told this to people who sent me the “Morton e-mail,” but repeat copies of this absurd e-mail just kept coming. The “son-in-law” this e-mail is referring to is Dr. Andrew Schiff (called Drew Schiff), who married Al Gore’s daughter, Kareena, in 1997. Again, what we have in this 2007 e-mail is the “Levi Morton effect”: the assumption that having a “Jewish” name (i.e,, “Schiff” or “Nathan”) means the person with that name is Jewish. Yes, Dr. Drew Schiff is the great-great-grandson of the famous Jewish banker and philanthropist Jacob Schiff. However, while Drew Schiff is proud of being related to Jacob Schiff, he is only one-quarter Jewish by ancestry and was raised an Episcopalian. Schiff and Gore were married in the National Cathedral in Washington, D.C.
Mayor Giluani’s current and third wife, Judith Nathan, also has a “Jewish” last name. However, like Rudy Giuliani, Judith Nathan was born into and raised in an Italian Catholic family. Also, like Rudy, Judith Nathan has been married three times. Her second husband, Bruce Nathan, is Jewish, and Judith kept his last name after they divorced. Why do so many Jews apparently believe these factually wrong e-mails and send them on? My theory is that these e-mails tend to circulate among an older and more traditional group of Jews. In this group, there is still a certain disconnect about the fact that so many Jews are in an interfaith marriage and that a “Jewish” name can have explanations other than that a famous person is Jewish. It can mean absolutely nothing–the name simply “sounds Jewish.” Or a “Jewish” name can mean the person has quite remote Jewish ancestry. Or, as in the case of Judith Nathan, a Jewish last name simply means that the person had a Jewish ex-husband. These e-mail writers are using a clue (names) about who is Jewish that was always shaky and is now very unreliable. Sadly, an absurd amount of Jewish people who receive these e-mails believe them and proudly send them on. Interestingly, these same “chain” e-mail writers always seem to miss really interesting stories of Jewish persons related to famous non-Jewish politicians–the stories of persons who came into the Jewish community because of intermarriage. In some sense, their stories are the flip side of Drew Schiff’s family history. Two names sprang to my mind: Rabbi Joshua Boettiger, a Reconstructionist rabbi who is the grandson of President Franklin D. Roosevelt, and Claudia Taylor Brod, a convert to Judaism and granddaughter of President Lyndon Johnson. Rabbi Boettiger’s interesting path to becoming a practicing Jew and studying for the rabbinate was detailed in this article, originally published in The (New York) Jewish Week. An update: Joshua Boettiger has completed his rabbinical studies and is now the rabbi of Congregation Beth-El, in Bennington, Vt.
Claudia Taylor Brod is the youngest child of Luci Baines Johnson, LBJ’s youngest daughter. Brod met and married Dr. Steven Silvers, a Jewish physician, and converted to Judaism in 2003.